Here are some things I've been eating for breakfast! I think most of my photos are always from breakfast because they're the most fun to photograph. And my new favorite way of having overnight oats. I basically mashed a 1/3 of a banana, and mixed it with oats, some coconut flour, and almond milk. Then, I added a bunch of black currants and nuts--this was all done the night before. The next morning, I added all the toppings and the reason I love this is that the nuts are perfectly soaked. This makes for great texture in my opinion! We'll just call it Fruit & Nut Overnight Oats? How creative right? 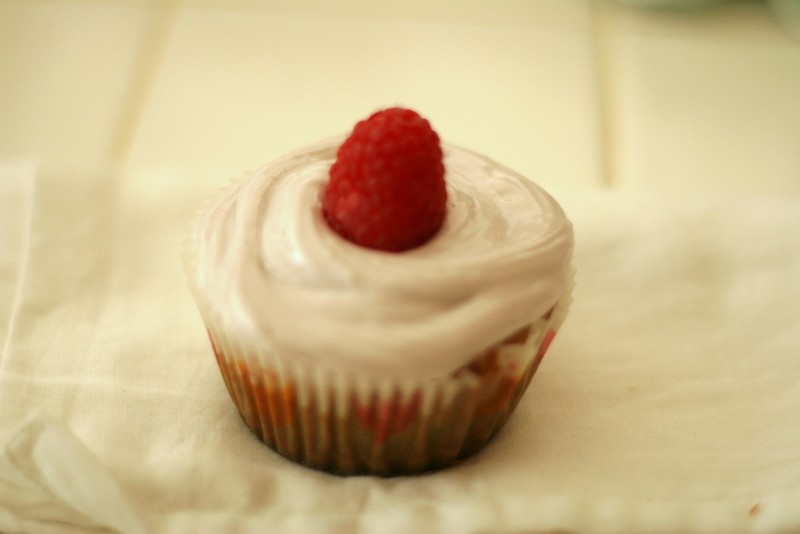 This past weekend I also made some nutrient dense cupcakes. These are not necessarily low-calorie treats, but they are still healthier than the more decadent alternative. Instead of only using all purpose flour, I used some ingredients that give this dessert a punch of protein and less sugar for those who are sensible due to health reasons. AKA: My pappa who has a slightly higher-than-desired blood sugar level. In lieu of blue dye, I squeezed the juice out of frozen blueberries to rend the frosting a pleasant lavender color. Just because everything is prettier in pretty pastel colors. First, preheat the oven to 350 F. Now start out by mixing all of the dry cake ingredients in a bowl. After having made the sour milk, add it in along with all the wet ingredients. Beat thoroughly, just do not over beat it so that the air will stay inside the batter and produce fluffier cakes. Next, put cupcake liners in the cupcake pan and fill them up with batter up to 3/4 of the way. Pop it into the oven for approximately 25-28 minutes or until golden brown. For the frosting, use a stand mixer or hand mixer. To prepare the blueberry juice coloring, simply microwave the frozen blueberries for about 15 seconds. This should produce some blue liquid, about 4 tsp. Afterward, mix the Neufchatel, butter, and milk on med-high speed until it's rather smooth. It's okay if there are some clumps. Add the powder sugar and finally about 4 tsp of the blue liquid. Mix until it is silky. When the cupcakes are done and cooled on a rack, you can start frosting by piping the cream, or simple plunking it on top. :) And it is finished! Do you use food dye/coloring? I hope you have a blessed day full of joy, love, and peace! Remembered that you are abundantly loved by Christ!